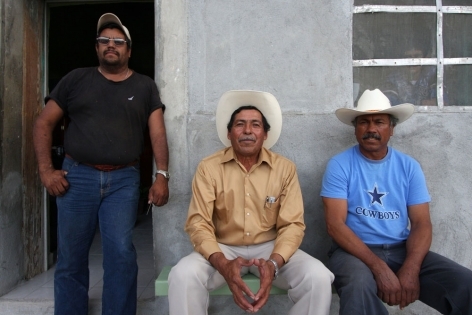 ZACATECAS, MEXICO—Five years ago a new neighbour arrived in Mazapil, Mexico, promising employment, medical services and general development for the local peasant communities as it hoped to develop one of the world’s largest gold mines. The newcomer—Canadian mining company Goldcorp Inc—built its mine but has yet to honour its promises to the thousands of people of Mazapil. Particularly for the residents of Cedros, Las Palmas and El Vergel—communities adjacent to the massive industrial complex—hope for a brighter future has dimmed. In fact, Goldcorp’s Penasquito Mine has turned out to be a troublesome addition to the community, guzzling the municipality's scarce water sources, while its most significant contribution has been contamination and social division. 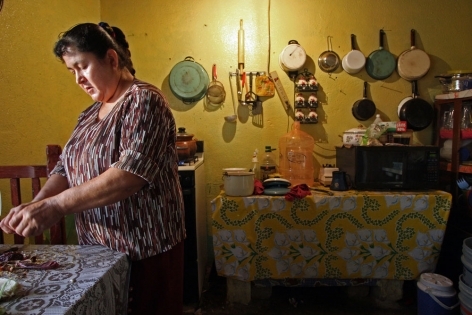 “Even though it has been a mining town by tradition, [Mazapil] has never been prosperous. Its population has managed to survive off agriculture and the raising of livestock,” according to an April 2010 article in the local paper, El Diario de Coahuila . The ejido system still prevails in this part of the country. It consists of community members, known as the ejidatarios, sharing a common landholding, both for agriculture and residence. 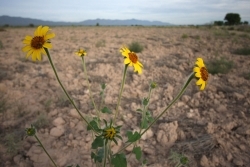 Despite an annual rainfall lower than 400 millimetres, the local ejidos have managed to subsist thanks to massive aquifers that provide vital groundwater, used primarily for the irrigation of crops. In Mazapil, the main underground water reserves are located directly underneath the ejido of El Vergel. “Our life support system depends on water, because we live off what we harvest!” says Irma Hernandez Herrera, resident of El Vergel. 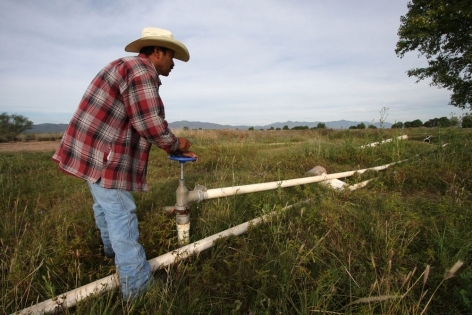 “Here we grow chili peppers, alfalfa, corn, beans, squash; and our lives depend on this, because this is what we eat.” Nevertheless, since 2007, groundwater levels have been declared critical statewide as water tables have suffered an annual deficit of 220 million cubic metres. Before mining operations began, a contract between the people of El Vergel and Goldcorp stipulated the perforation of 10 wells for industrial use. By the end of 2009, Goldcorp was operating 30 wells. 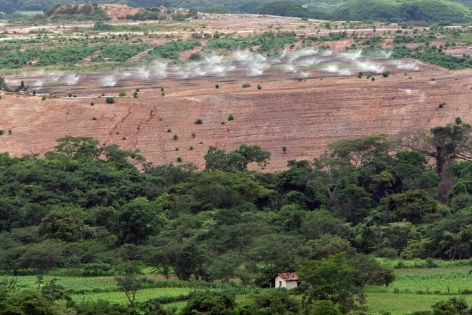 Joel Mancilla, Commissioner of El Vergel, accuses “the mining company of using in one hour the amount of water a local family would use in 25 years.” Goldcorp’s disregard for previous agreements and Penasquito’s inordinate use of an already precarious groundwater supply have caused widespread unease among the local population. 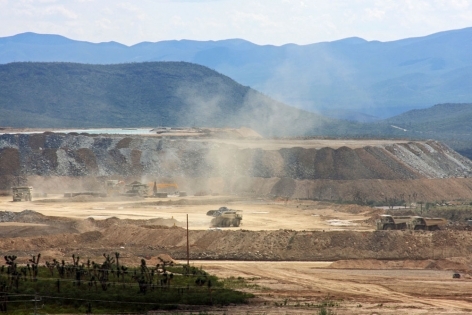 This image is from another Goldcorp-owned mine, the San Martin Project in the Siria Valley, Honduras. It shows the same cyanide leaching irrigation method used at Penasquito. Ten years after having begun operations, the environmental disaster in the Siria Valley is evident. 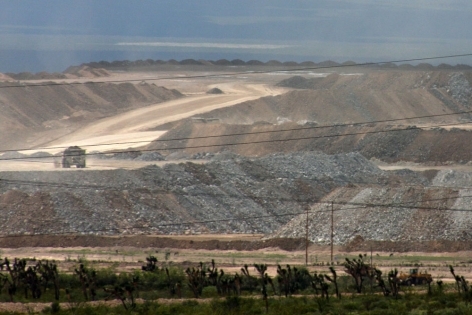 Adjacent communities have reported hundreds of health issues involving intestinal and/or renal cancer, nervous system disorders, and research from a 2006 study found that 96 per cent of the population suffers from rashes and other skin problems, most likely caused by exposure to toxic materials from the mine, according to Daniel Trujillo in Diario Co Latino . "The mine’s wells reach 300 metres below the surface, while ours at El Vergel only reach 100 or 130 metres," according to Armando Gonzalez Alvarado, resident of El Vergel and member of the Negotiation Committee with the mining company. Penasquito, an open pit mine, will require thousands of litres of water per hour over its estimated 22-year lifespan. “Penasquito is expected to produce about 500,000 ounces a year of gold, 28 million ounces a year of silver, 450 million pounds a year of zinc and 200 million pounds a year of lead,” according to an article in miningweekly.com. If the price of gold per ounce remains this high, Goldcorp can expect to earn around US $600 million per year from gold production alone. These profits do not benefit the people of Mazapil, and for several days in May 2009, residents blocked the entrance to Penasquito, demanding a monetary adjustment for the 6,000 hectares leased out to Goldcorp. From property taxes alone, the municipal government of Mazapil should be receiving one million pesos annually from Penasquito. Such revenues would come in handy in a municipality where 30 per cent of the population has running water, 65 per cent has electricity, 18 per cent has sewage systems, three per cent has a garbage pickup service, 50 per cent enjoys public security and 7 per cent of roads are paved. 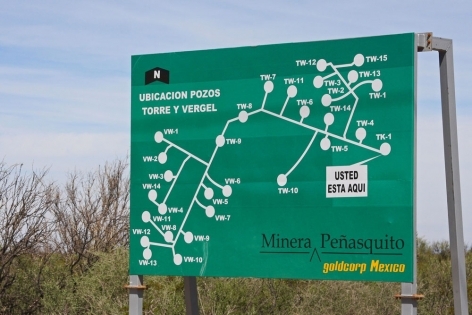 Vicente Perez Esquivel, Mayor of Mazapil, said that since 2007, when the first stage of operations began at Penasquito, the municipal government has not received any tax payments from Goldcorp—not even the construction license fees. 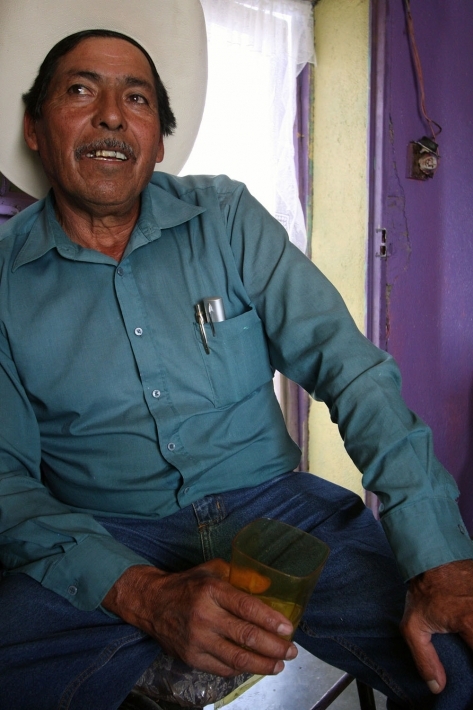 "We have had a very hard life and struggled enormously to upkeep this ejido ," says Hernandez Herrera. "We have already suffered so much, and now, this monster comes to devastate our territories. What will we do once the water runs out? And it is clear that it will run out! Because in every place where a mine establishes itself, the water eventually runs out." 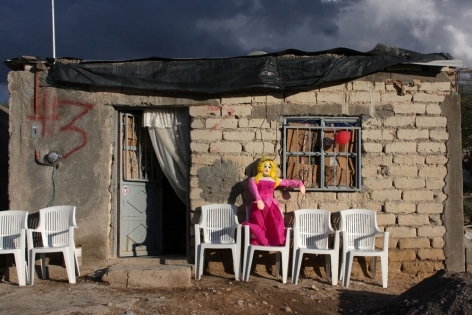 James Rodriguez is an independent documentary photographer based in Guatemala. He authors mimundo.org, where a version of this photo essay was originally published.